With sunny beaches, culture, shopping and outdoor fun, what more could you ask for in a vacation destination? You can experience all this and more when you travel to Naples, Florida. Located on the Southwest of Florida, on the side of the Gulf of Mexico, Naples offers many great beaches such as the Lowdermilk Beach Park with its white sands and aqua water. Find fantastic sea shells along the Barefoot Beach. At the Delnor-Wiggins Pass State Park, not only can you enjoy swimming, sunbathing, snorkeling, boating and fishing, but you can also observe wildlife species like bald eagles, ospreys, manatees and loggerhead sea turtles. You can also catch glimpses of wildlife as you walk along a boardwalk through mangrove trees at the Clam Pass Beach Park. Other good beaches include Vanderbilt and North Gulfshore Boulevard Beach. Though not a beach, the Naples City Pier is one of the city’s most visited attractions. Extending 1,000 feet over the Gulf of Mexico, the pier is an excellent place to fish, watch dolphins and admire amazing sunsets. You can’t visit Naples without experiencing its spectacular shopping scene. Splurge, or just stroll around, the open air malls like the Village on Venetian Bay, the Waterside Shops and the Big Cypress Market Place. Even if you don’t buy a thing, do have a look around Fifth Avenue Street to admire the colorful buildings. Near downtown is the popular shopping district of Tin City, where you are more likely to find a bargain among the antiques and homemade crafts. Enjoy the city’s arts and culture by checking out Gallery Row, the downtown area containing numerous art galleries. Additionally, you can admire a wide range of art works among the 15 galleries housed in the Naples Museum of Art. Allow yourself to be captivated by splendid performances at the Philharmonic Center for the Arts, which is home to the Miami City Ballet and the Philharmonic Orchestra. Enjoy live productions from the community theater company, the Naples Players, at the Sugden Community Theater. Nature lovers will love Naples for its abundance of wildlife sanctuaries and preserves such as the Everglades National Park, the Florida Panther National Wildlife Refuge, Picayune Strand State Forest and Big Cypress National Preserve. The Corkscrew Swamp Sanctuary shelters 11,000 acres and offers glimpses of alligators, Florida black bears, whitetail deer and several species of birds. Additionally, when you travel to Naples, you can take advantage of dolphin and manatee tours where you won’t be disappointed. If you enjoy playing golf, you will be spoiled for choice in Naples with more than 80 championship golf courses. If tennis is your game, the city presents the Oliver Group Champions Cup competition every year. If visiting in January, March or October, you don’t want to miss the swamp buggy races in Naples, which attracts fans from all over the nation. Can’t wait to visit Naples? Fabulous hotel deals are just a click away. 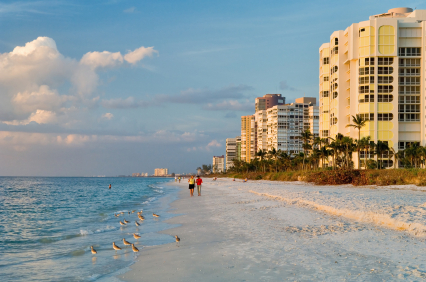 Secure your reservations today and begin your exciting travel plans to Naples, Florida.